Our success as a driving school can be attributed to our excellent driving instructors. They focus on teaching their students safety, attentiveness and fundamentals while on the road. The instructors also want to make the environment as comfortable as possible so it can be conducive to learning. Each of them speaks both English and Spanish so they can best help any student! Luis is a trusted driving instructor with a passion for what he does. 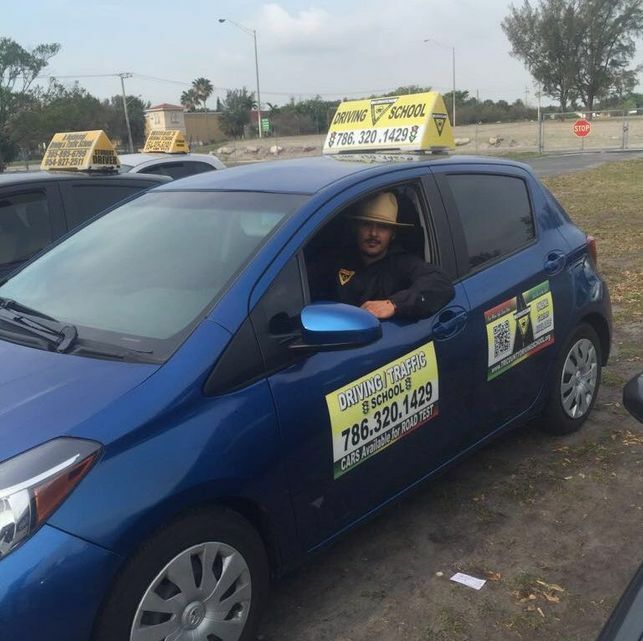 He has been conducting driving lessons for over five years in Southern Florida. He understands that learning to drive is a process requiring practice and patience. While helping his students feel comfortable behind the wheel, he also adds a high level of professionalism interacting with them. He wants to make driving fun while still instilling the fundamentals in each student. Luis feels strongly that safety is the first priority in operating a vehicle and makes sure his students are trained properly to be defensive drivers. Nubia is the actual manager and the first female instructor of Tricounty Driving School. 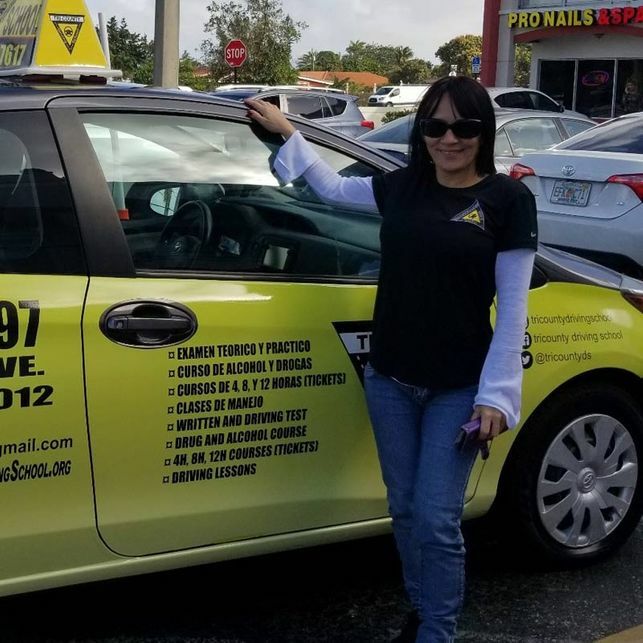 She learned everything she knows working hard as a driving instructor as she gained the love and gratitude of the many students and families that she helped to obtain their driver’s licenses. Today, she’s in charge of coordinating and supervising all the instructors and the learning process of all the students. At the same time, you can stop by the office and see her helping all those who go there to study and take the written exam that they’re supposed to pass to obtain their first learner’s license. 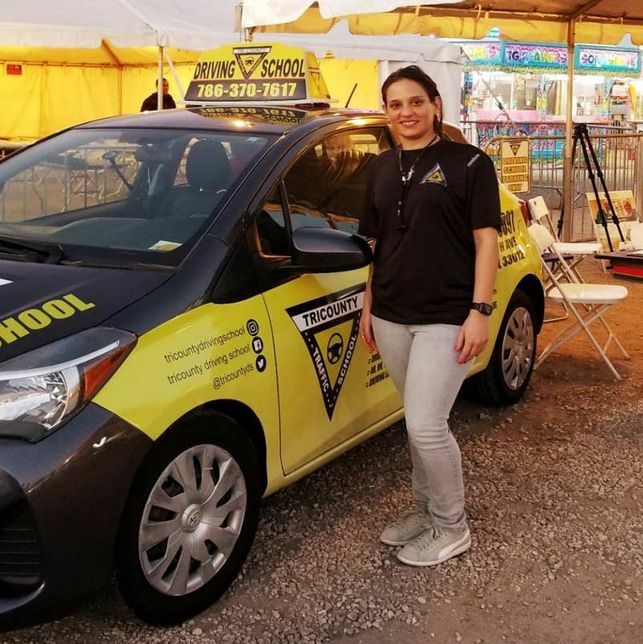 “Let’s work as hard as we can to be able to drive safely in our streets”: that’s the main purpose of Tricounty Driving School, according to Nubia. Instructor Kelly is the sweetest person you could learn how to drive with. Her kind and outgoing personality turns her driving lessons into a wonderful experience, while her students learn how to be safe on the road and how to be confident enough to start driving once they complete the road test with us. Soon enough, her students become well-prepared and excellent drivers, ready to safely drive their own cars in Florida. You can’t go wrong with any of our instructors. With each one, you will receive a quality driving education. Contact us today to start lessons!